I know it’s sort of (ahem, um, definitely) dorky to post twice in one day, but I can’t help it – I’m too excited. You know how earlier I mentioned that my status as a student wasn’t official until this afternoon? 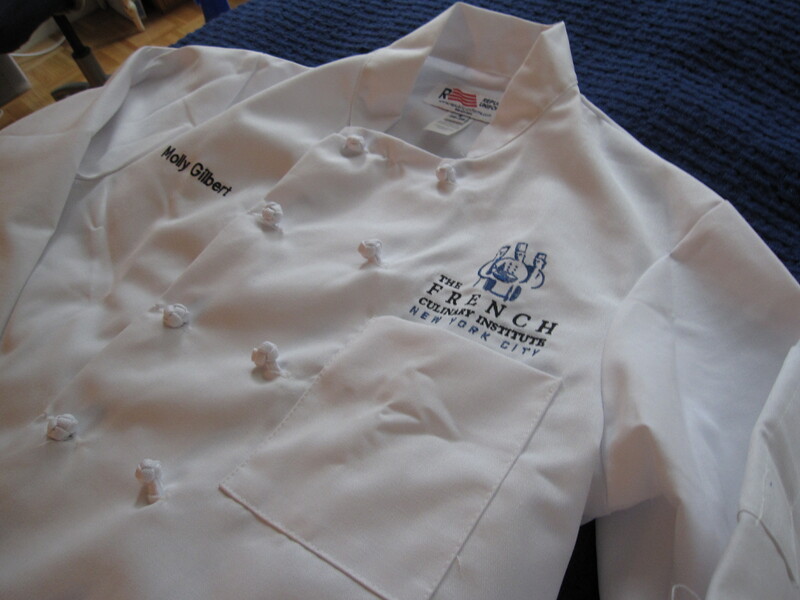 Well, this afternoon happened and I am officially a student at The French Culinary Institute. Yaaaay! I mean, uh, whatever man, that’s cool. This afternoon kicked off the experience with orientation, and I must say I’m feeling quite happily orientated. At around 2:30pm, the new culinary and pastry students gathered by the bar at L’Ecole (the FCI student-run restaurant below the school itself), everyone glancing around nervously and making awkward small talk with their neighbors. Just as we were all starting to run out of shallow banter (And your name is? It’s nice to meet you! Where are you from? Oh, Dallas! Neat! I’ve, uh, never been there), we were herded upstairs to get our “Hello my name is” nametags and materials and watch a presentation on what we can expect from the next six months. 1. Class starts at 9:00 am sharp. 2. Missing class is a bad, bad thing to do. 3. People steal things from the locker room, so buy a lock if you want to keep your stuff. 4. Nail polish, perfume and jewelry are strictly prohibited while in class. Crap. 5. The uniform is, uh, not cute. They make us wear hats. And neckerchiefs (whatever those are). The coat, however, is sort of awesome. Eh? Eh? How cool is that? It says my name and everything! It almost makes up for the neckerchief. Almost. NO NAILPOLISH? WHAT IS THIS PLACE? i echo the sentiment of anonymous. no new summer essie line!? seriously…no more manicures…this is a sad day…no worries…i will get them in your honor…but so exciting! Well, you've always looked good in hats. So wear it proudly. And good luck on your first day!